The Murray Academy was founded in 2005, bringing Irish step dancing to the Seacoast Region of New Hampshire. With a convenient location in Exeter, NH, the Murray Academy provides children from all areas of the seacoast and beyond with the opportunity to discover and participate in the wonderful world of Irish Dancing. Our Goal is to is to realize your child’s full potential and to provide them with a wonderful and memorable experience. Whether it be for the tradition, culture or sport of Irish Dance, our dancers receive the best training and mentoring possible in both solo and team dance. We want our students to enjoy coming to classes, benefit from the healthy exercise Irish Dance provides, gain self-confidence through performance experience, and enjoy successful competitive results. We help each dancer become the very best that they can be. WE INVITE YOU to join us today and be a part of one of the fastest growing, competitive schools in New England! Today’s beginners are tomorrow’s champions…we look forward to hearing from you!! The Murray Academy is proud to be home to over 150 dancers. We are a cohesive group of dedicated teachers, assistant teachers, supportive parents and wonderful students, committed to learning and growing. There are many different reasons why our Murray families participate in the world of Irish dance…whether it is for sport, exercise, or family tradition, our Murray dancers just love to move their feet! Classes are offered for all levels of dancers, from Pre-Beginners ages 3 ½ to 5, to beginners through to champions. We help our competitive students set and achieve goals, including those dancers who choose to and earn the right to compete at the highest levels of the sport. We work hard to provide not only productive classes but extra-curricular opportunities that round out our students’ overall dance education, including master classes/workshops and school-sponsored family events each year. The skills taught in Irish dance prove to be invaluable many years later for so many involved. Through their Irish dance experiences, students learn more than the art and sport of the dance — they build lasting friendships and learn life lessons that can be applied in so many different arenas. For example, through competitive team and solo dancing and performing in shows, students learn teamwork, self-discipline, physical fitness, managing stress/nerves in competition, being comfortable in front of an audience, and winning/losing gracefully. Anne Murray MacRitchie, TCRG is the founder and director of Murray Academy. She started her Irish dancing career in Cleveland, Ohio at the age of 7 under the direction of Theresa Burke, TCRG, ADCRG. Anne was both an open championship level dancer with extensive exhibition and competitive experience as well as an instructor for the Burke School, a large, well-known dance academy in the Midwest. A two-time Mid-West regional champion, Anne qualified for the World Championships by placing in the top 5 of all 8 Mid-West Regional Championships (Oireachtas) in which she participated and ultimately placed fifth in North America. She was also on many award-winning teams. She went on to earn her TCRG qualification (certified by the An Coimisiun Le Rince Gaelacha) in Toronto in 1984 and is currently a member of both the Irish Dancing Teachers Association of New England and the Irish Dancing Teachers Association of North America. 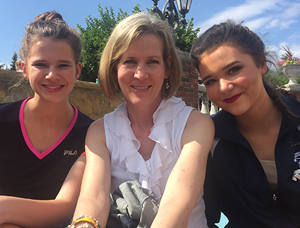 As a certified teacher and founder of Murray Academy, Anne shares her love of Irish dancing with her students, one by one. She absolutely loves to teach! She gives as much to her students and their families as possible, to help them achieve the same positive experience from Irish dancing that she was fortunate enough to have! Through Irish dance, Murray students carry on an important aspect of Irish tradition and culture, thereby gaining a lasting appreciation for the rich heritage of Ireland!